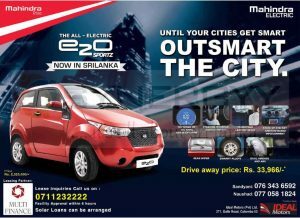 Ideal Motors (Pvt) Ltd brought you first India electric automobile to Sri Lanka by Mahindra Electric e20 for Rs. 2,325,000/-. Leasing Available for Rs.33,966/- from Multi Finance.